Well it had to happen. I had managed to get far enough ahead with the decluttering to carry me through my vacation and a couple of days out the other side. Alas, now I have run out of my pre-decluttered items and I have to declutter for real again. It wasn’t hard to find something considering I had lived without it all for a month and have long since come to the realization that we probably don’t need/want half of the stuff around here anyway. 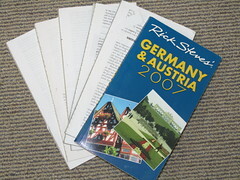 While getting my jewellery box out of my bedside cupboard, I came across a pile of Rick Steves travel guides we had used on our last trip to Europe three years ago. I had kept them with the intention of using them to help make a scrapbook. In that three years, I don’t think I have even looked through all the photos we took let alone start making a scrapbook. At this point I am fairly sure that it isn’t going to happen so this pile of pages can go in the recycling. If you are wondering why the book is torn apart there is a good reason for that. As you know travel light. We also carry a day bag with us when we go out sightseeing. In the day bag we carry a face cloth (micro-fibre), sunscreen, some ibuprofin, two water bottles and a few other incidentals. Because the travel books are heavy we separate out the sections of the countries we are going to visit and only carry those with us on the trip. When we are in a particular city, we only carry the section we need for that city and maybe a more comprehensive map if necessary. Since we usually buy the travel guides several months before a trip for planning purposes, by the time we have finished with them they are out of date so there is no point in keeping them in tact to pass on to anyone else. We got even smarter at light travelling on this trip and discarded the used parts as we went along to lighten our load. Some of the places we stayed had an area set aside where you could leave books to share so we left our guide book section relating to that city, maybe someone would find it useful. It is amazing the useless stuff you find lurking in cupboards when you take the time to look. These books have been wasting space in that cupboard for years when I could have used that space for something more appropriate. Stuff can be such a waste of space. Think of a space in your house that you feel contains stuff inappropriate for the location. First of all declutter that space and then see if you can find a more appropriate space for the items that you wish to keep but seem out of place. Spring – I took my first walk around the neighbourhood today since being back and spring has sprung in my absence. I will take my camera with me tomorrow and snap some pictures of the lovely flowers and post them here for you soon. Salt & vinegar chips – MMMMMMMMMMM I love their salty, vinegary goodness. I think the pantry is calling me. Cameras – Where would my blog be without a camera. I would have to draw a picture of the item each day and wouldn’t that be hilarious. Actually I am not that bad at drawing so it may actually be OK but time consuming. Fresh Produce – I am making homemade pizza for dinner tonight. So many yummy ingredients, potato, basil, cherry tomatoes, zucchini, egg plant, mushrooms, red bell peppers (capsicum to us Aussies), feta & Parmesan cheese, garlic, rosemary out of my garden and much more. Bread Making Machine – I use this to make the dough for the pizzas. Actually, you just need to find a friend who can type to help you with that trip scrapbook. Except, I wouldn’t make it necessarily a scrapbook. Every time my mother goes on a trip (I have no money, so I go nowhere), I make her sit down and tell me about the trip while I type up the story. Then we add her photos to the story, and voila! a trip journal emerges. The only time we didn’t do this together, she never finished the trip journal. So next time, find a friend or kid who wants to hear about the trip and record yourself telling about it. Then type it up yourself (since it seems that you can type). Or have a friend help you. Journeys are meant to be shared. I understand what you are suggesting here and it would make the task more enjoyable but I am really just over putting scrapbooks together. I used to save all the tickets, maps, guides, etc, etc ,etc but I now just think it is all clutter. It feels so freeing not to have to bother, which is a bit of a shame really because I used to enjoy it so much but now it is just a chore. In my experience and I have travelled a bit, other people really quite often just think you are bragging and although listen to your stories politely, they really aren’t interested. I am going to write a blog about vanity/pride very soon and the clutter that that generates where I will touch on this very subject so stay posted. We’ve been having enourmous journeys (as Americans temporarily living in Europe). So I’ve been downloading our photos and using SMILEBOX (TM) to make cute ‘slide shows’ to e-mail to family/friends. There are several options with SMILEBOX, I use the free option, so the viewers have to sit thru a few seconds of ads. Our Rich Steves travel book is falling apart at the seams, but we still tote it along on our journeys and just use the pages we need for that day hike/drive/adventure. I’m not at all into Scrapbooking, so for our own personal use, we upload our photos into a slide show to save on our computer and use it as a screen saver – the kids love to see glimpses of it here and there as we go about our day! As a minimalist, I’d rather not have the hard copy photo/brochures hanging around to store, so we’re more on the digital end of that process. thank heaven for digital. We try to keep things as digital as possible too. On our previous trips we have taken a laptop with us but this time we took a small device to charge the i-pod touch and camera through and that was it. I think my husband has found a way to avoid the taking the small device as well now so we will be able to go even lighter next time. All our travel details, flights, hotels, pre-booked tours were all on the i-pod touch so we only needed one document other than our passports throughout the entire trip and we printed along the way at an internet hot spot. I’ve finally moved Colleen and as I unpack I am still finding tons of stuff to get rid of. It never seems to end. My new place is larger than the last apartment, not by choice but all I could find, but I still want less stuff in it. I am so pleased for you and it is never too late to declutter more. I am so looking forward to hearing that this new place of your is working out well and you are finally settled. Please keep me informed good or bad I am rooting for you (which is really hard for me to say as an Australian as it means something completely different to the sentiment intended here). He he – non-Aussies you must google this! Thanks for the smile, Colleen. trust you to be inquisitive you naughtly little minx. Just when you got back home, my internet went out and we just got reconnected last night. I went back and read your recent posts. Gotta tell you that I stayed at the Beehive in 2001! The hostel has moved to a new location and it’s MUCH larger now, I understand. It was great when we were there (for a full week) and I’m sure it’s much better now. AFter a short weekend trip, I’m back to daily chores and decluttering is always part of my day-even if it’s just decluttering a few papers. The Beehive maintains too locations both within a couple of blocks either side of the railway station (Termimi) one has private and hostel rooms with shared bathrooms while the other has only private rooms with a shared bathroom. Neither are flash but both are comfortable and affordable but the first has the extra facilities that make it like a home away from home. Neither are airconditioned though but have fans. Paper, it’s like the opposite to socks while they seem vanish paper seems to multiply. People keep telling me that the decluttering will never end but I refuse to believe it. I prefer to think that I will finally get to a level of stuff I am happy with then it will just be maintenance after that. After reading this post I realize that I have some travel books stashed away that I bought prior to having my daughter – when I thought I’d get to do more travelling. Ha ha! Anyway, your post has inspired me to send them off to the used book store tomorrow since by the time I need them they will be obselete. More useless stuff out the door! Woo hoo! I used to think that I had to write about things deep and meaningful (and probably wasn’t that successful at it) in order for people to find my post interesting. But somethimes I get the best response from the everyday stuff that just sends out a reminder to people that makes them think “Yes, I have one of those lurking around here.” I am glad I helped you find a lurker and get rid of one more thing. By the way, in tomorrows favourite five there is a blog I just found last night about a 42 years old woman who just uprooted herself and her husband and moved to France to find a new life for herself and I thought you may enjoy it as much as I am. She seems to be more than a little like us in personality and where she is in life. I checked out Bobbi’s blog and you are right. Although I think she is little further down the path we are both heading. Reading her blog made me simultaneously want to stand up and cheer AND heave my monitor at the wall. Joy for her and frustration for me all at once. I understand how you are feeling. It isn’t so easy when there are as many variables as you have to consider. I did take the first step on my journey on Friday and submitted my resignation. Now all I have to do is starting exploring my options, luckily or maybe not so luckily it is only mental road blocks there that I have to deal with. Hey Colleen – I did google “rooting for you!” –I get it now!! Isn’t it amazing that we live on the other side of the world (I am in Florida US) and we all have similar issues of clutter, scrapbooking etc. Maybe we aren’t so very different after all (OK -join in a chorus of “We Are the World”). It is interesting to me to read about your spring beginning when I am thinking about fall sweaters and even different expressions for red peppers and other activities! You should come down here and live the Christmas experience. Think BBQ in the back yard and a dip in the pool or a trip to the beach lathered in sunscreen. I thought I had experienced my first “real” Christmas when I went to live in Seattle. Even though I had only ever had summer Christmas we still have all the same visions of it from greeting cards and decorations with snowmen, Santa at the North Pole, snow frosted pine trees etc. Not to mention all the TV Christmas specials that are made in the Northern Hemisphere as well. It was all very exciting. I dare say you are right about the clutter problem being very universal though. I think it is only the very poor who don’t have this problem and yet when I see picture of ghettos in Africa and places they seem to always be wallowing in garbage. I can never understand where the garbage comes from when they can barely afford to eat never mind buy anything that generates rubbish. I hope someone will explain that to me. if we (industrialised world) wouldnt have a functioning trash pick-up-system, we would live in garbage, worse than ANY slum area you can imagine.